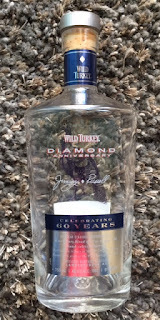 Wild Turkey Diamond Anniversary was released to commemorate Jimmy Russel's 60th year working at the Wild Turkey Distillery. Obviously he wasn't in the role the entire time, but the master distiller at Wild Turkey is one of the top celebrities currently in the bourbon world, and his career is certainly worth celebrating. I couldn't imagine doing anything for 60 years, and this milestone is nothing short of incredible. These bottles, however, are what have been described as "shelf turds." I'm guessing this is due in large part to the fact that it's a $130 (or even up to $150) bottle, and it's only bottled at 91 proof. This doesn't exactly scream to bourbon enthusiasts, "Hurry up and buy me!" Reviews have been somewhat mixed on this release as well, further adding to the general lack of interest. Nonetheless, I decided to give it a try for myself. The nose is very pungent, the kind of whiskey you can smell from across the room. It is almost entirely vanilla, with a very light cinnamon spice to it as well as a nutty note. The burn is not noticeable at all, but I guess that's expected given the proof. The flavor, however, is not as sweet as the nose. 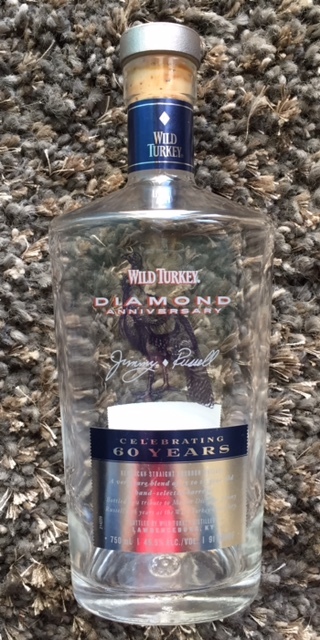 It's got that traditional Wild Turkey flavor, something that I've come to associate with higher rye whiskeys in general. It has a very distinct wood character to it, a strong oak influence. It also is heavy on the vanilla, though not a sweet vanilla as the nose would make you think, but more of an unsweetened vanilla, like tasting vanilla extract. It's got that long, drawn out spice at the end that is common to Wild Turkey products. It's got a full body, which makes sure the bourbon really coats the mouth and helps that spice linger for quite some time. After a few pours I started to notice a sweeter, pecan flavored note alongside some herbal notes that I couldn't quite place. It was somewhere between dill and oregano. It wasn't strong, but was certainly noticeable if for no other reason than it seemed very out of place. It didn't matter much, though, as those flavors seemed to be quickly consumed by the dominant wood flavor that persisted from beginning to end. For such a special release (not to mention the hefty price tag) I really expected a more special bourbon. In that sense, while this was a good bourbon, it was a bit of a let down.